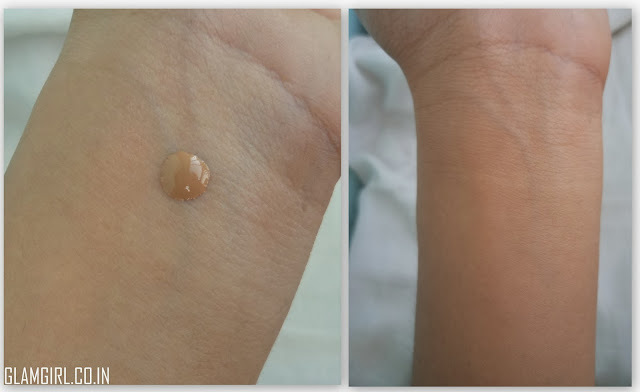 The HD Foundation combines flawless coverage and an extremely natural finish.The Sericite contained in HD foundation heightens the diffusion of light and intensifies the glow of the skin. In my recent visit to Sephore, Delhi I brought this foundation. The bottle is really gorgeous. There are very few foundation yellow enough for my skintone. Now I realise, this needs some research. May be I need to explore some more brands to find my perfect match. This is lightweight, sheer coverage, natural finish foundation. It is very light on skin and doesn’t feel like wearing makeup. I love its texture: very smooth, natural and shine-free. I like almost everything about this foundation except the ‘color’. This is exactly my skintone but, as I said ‘not yellow enough for my skintone’. It has brown- red tones, which makes me look dull and dark. It doesn’t bring glow to my face. You can see in the above picture. On the left pic my skin has yellow tone but after blending the foundation the tone looks red-brown. Doesn’t reflect light in photographs. Will I buy it again: Only if I find my match. Do I recommend it: Yes, it deserves at least a try. If you find your match grab it. You are going to love it.